This week I start off with more Mexican inspired food because you know how well I love the stuff! It is also the week I kick of healthier picks from the shelves of Target. Now since the 'clean police' have raided social media and tried to shut down anything they feel is not 'clean', people are afraid of anything from a box or a can. It is silly because you can find healthy picks in the frozen section of the store or canned veggies with more nutritional value than what has been trucked in from over seas in the produce department (depending on season). Last week Target rolled out a lot of new vegan products and Matt and I picked up a few to try out. 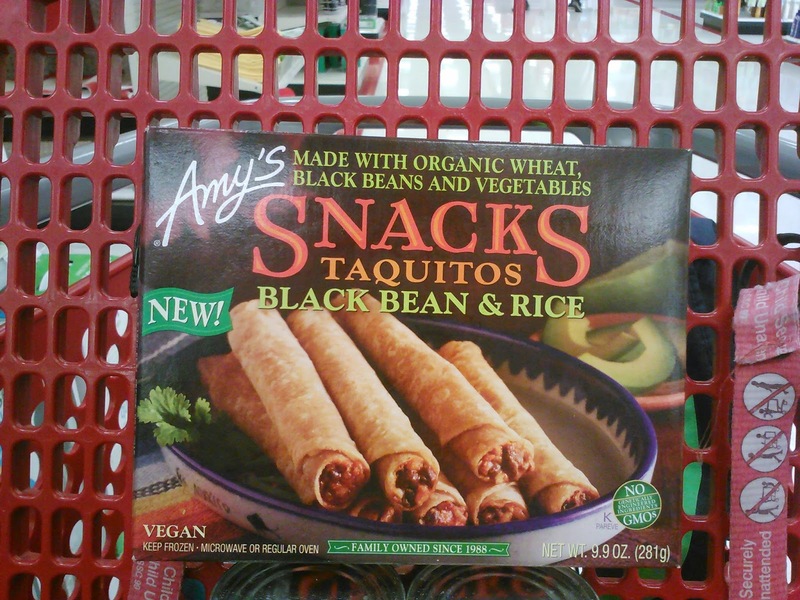 One of them being Amy's Black Bean and Rice Taquitos. They are not even listed on the site yet - super new right? What makes them a healthier pick is they can be baked (like I made them) in the oven and for 2 rolls they clock in at 190 in the calorie department. Traditionally taquitos are deep fried - so good (Go to Flacos if you are ever in the East Bay or Fresno!) but having deep fried food daily is not a wise option - sorry Matt I will not buy that deep fryer at Costco! These tasty lil taco rolls have a comfort food feel, taste yummy and can be topped or served in a variety of ways. I made them using vegan nacho cheeze sauce, garden fresh salsa, Golf Sauce (see Sept/Oct15 VegNews for recipe) and some pickled peppers I made last week. Since they are baked they do not have that super crunchy texture that you get from deep frying - but I am okay with that. They bake in about 15 minutes making them a fast lunch. If you are looking to make them into more of a meal, serve them with rice, beans and a side salad. These will be making a appearance in my Target basket again real soon! Oh yum, I tried my first ever taquitos in the bay area last year and I LOVED them!! I doubt this product'll make it over here but I have my fingers crossed! Amy's products are becoming more and more available in the U.K so I will see if this one makes it inthe U.K. I hope this reaches the UK too! I love the black bean enchiladas.